The shipping fleet operator's shares rebounded strongly in 2018 -- but you don't have to look far below the surface to find reasons for concern. 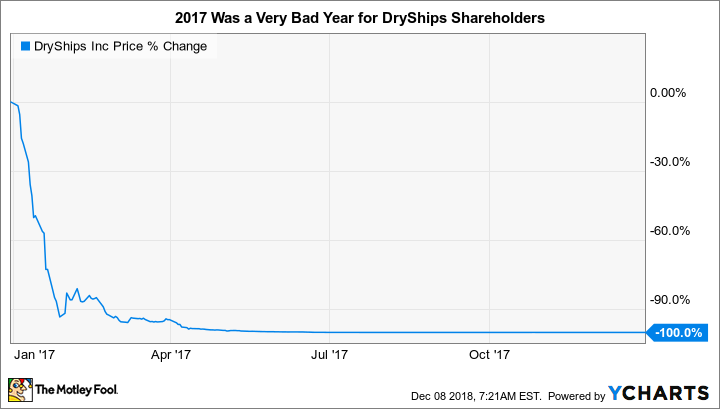 On the surface, it looks like 2018 has been a very good year for dry bulk ship owner DryShips (NASDAQ:DRYS). Through the first 11 months or so of the year, the stock is up 48%, a result that looks even more impressive when you consider that the S&P 500 Index has essentially gone nowhere this year. Those gains definitely reflect some upbeat information about the company. But investors need to understand DryShips recent history before they get too excited about its prospects. DryShips has three segments -- dry bulk carriers (the vast majority of its ships), tankers, and gas carriers. Through the first nine months of the year, its average charter rates for dry bulk carriers increased 63% annually, and tanker rates were up 67%. While gas carrier rates didn't move much, the addition of new ships led to a more than eightfold year-over-year revenue increase in the segment. The fleet was, basically, fully utilized in both periods. All in, DryShips' revenues more than doubled, going from $58.1 million through the first nine months of 2017 to $136.9 million in 2018. That lifted the ship owner from a loss of $3.36 per share in the first nine months of 2017 to a profit of $0.16 per share in 2018. The news has basically been good all year. In addition, DryShips just completed a $50 million share buyback, and it announced another $50 million buyback when it released third quarter results. But in this bit of "good" news lies a very big concern -- so big, in fact, that most investors should think very carefully before adding shares to their portfolio. While 2018 was a particularly good year for DryShips' stock and business, the same can't be said of 2017. The company's earnings fell far into the red, and the stock dropped more than 99%! In fact, as you can see below, the losses were so huge that some charts just rounded up to 100%. The key story from 2017 was that DryShips went on a buying spree to rebuild its fleet after it was forced to sell assets so it could pare down its burdensome debt load. Part of that process involved a credit agreement with founder and CEO George Economou, which provided the company the cash it needed to fund operations and begin to, slowly, rebuild. But slow wasn't the speed management chose: It aggressively added assets to its portfolio. To fund the swift rebuild of the fleet, DryShips sold an enormous quantity of stock to an unaffiliated investor, who turned around and sold the shares on the open market. So not only was the business under pressure, but its share count exploded by more than 2,000% in the back half of 2017, leading to massive shareholder dilution. It's little wonder that DryShips' stock price fell 99% in 2017. It's also not too surprising to see that the company is now trying to repurchase shares to clean up this mess. In fact, to help diminish the impact on the share price, the company executed several reverse stock splits. 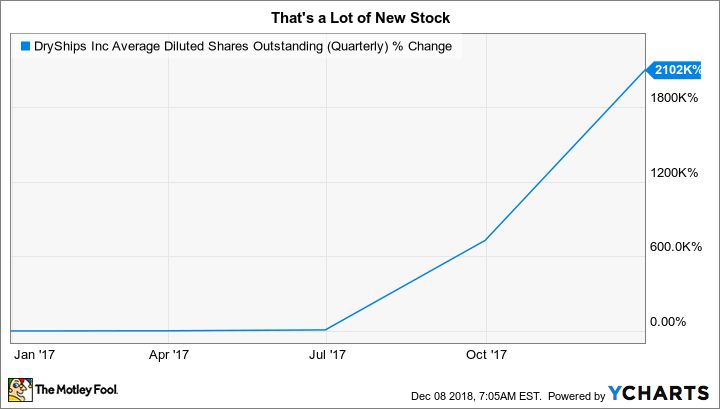 Sit down before you read this next sentence: The Motley Fool's Matthew DiLallo did the math, and DryShips' financial maneuverings amounted to the equivalent of a single 1-for-7,840 reverse split. That's a breathtaking number that should worry all but the most aggressive investors. You could argue that the company did what it needed to do to survive, and that its 2018 results are proof of its success. But there's more to this story than that, including the massive financial pain of the shareholders who held the stock over the last few years. DryShips shares are down, basically, 100% over the past three-, five-, and 10-year periods. The upturn in 2018 was little more than a blip compared to the long-term plunge caused by management's actions. And the worrisome moves aren't over yet: DryShips recently announced that it purchased four vessels from its CEO. At a company with a history as spotty as this, cutting deals with the CEO should raise some serious investor concerns. Simply put, there are better stocks out there, and most, if not all, retail investors would be better off avoiding this one. Before you by stock in a company, you need to trust that its management team has the best interests of shareholders in mind. That level of trust is tough to conjure up with DryShips. Better Buy: DryShips Inc. vs. Transocean LTD.